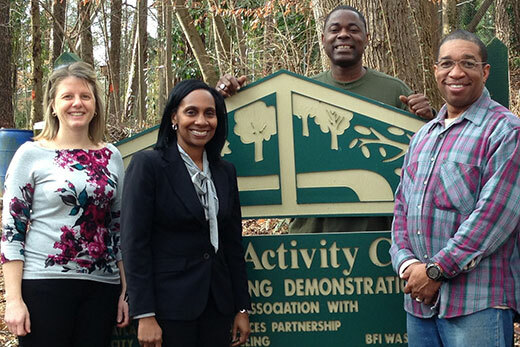 Emory’s Melanie Pearson (from left) poses with community advocates Na’taki Osborne-Jelks, Tony Torrence and Darryl Haddock of the West Atlanta Watershed Alliance. Atlanta is known as the city of trees, but underneath its lush green canopy sits an expanse of concrete and asphalt that directs rainwater runoff into low-lying westside neighborhoods. The situation is exacerbated because sections of the area’s natural drainage channel, Proctor Creek, were piped and buried decades ago and houses built on top, leaving storm water with no place to go. The flooding that occurs when Proctor Creek overflows into the English Avenue and Vine City communities is more than a frequent nuisance; it contributes to serious public health problems. The four-year-old HERCULES Center studies disease and health in the broad context of the exposome. Similar in concept to the genome, the exposome is a more inclusive definition of environment that embraces air pollution, water quality, and toxic chemicals, but also includes diet, stress, tobacco use, access to health care, and a host of other influences occurring over time. HERCULES scientists study the complex interaction among the various components of the exposome to more accurately identify potential health risks. At the same time, they are developing the tools, methodologies and protocols to advance this new approach to public health. What distinguishes the Proctor Creek Community Collaborative Health Survey from earlier studies is the participation of stakeholders living in the affected areas, according to Pearson.